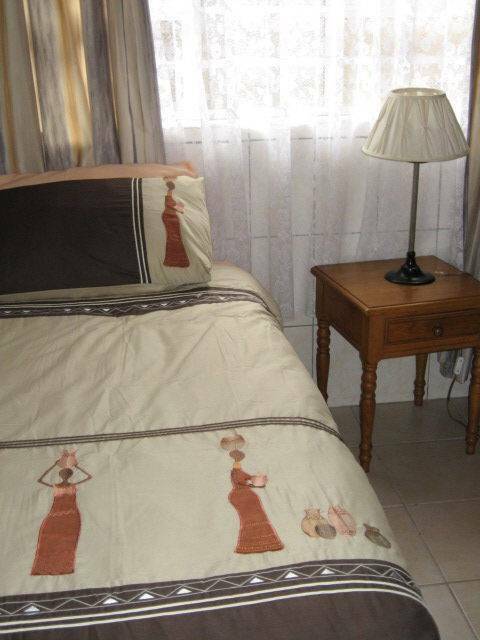 We are nestled in a quiet cul de sac over looking the Durban Harbour. 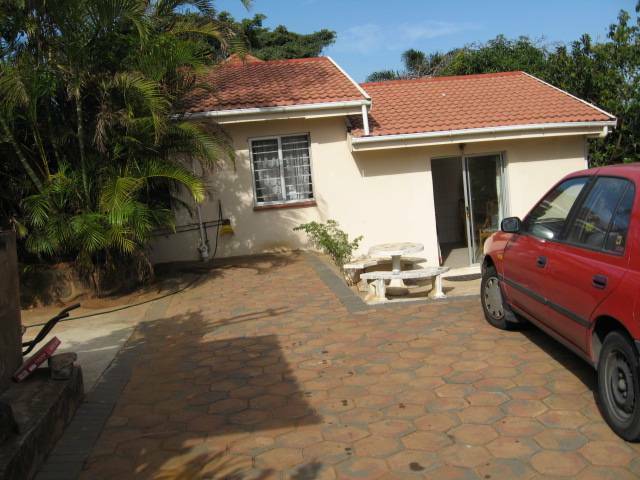 This comfortable cottage comprises 2 separate bedrooms each fitted with 3 single beds, a single bathroom with corner bath and separate shower, a fully fitted kitchen. 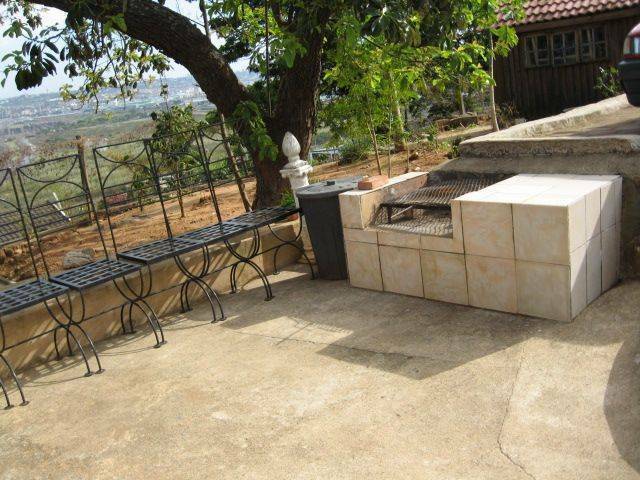 DSTV, private Braai facility and secure parking. It offers a wide selection of recreational and shopping options and is a easy 30 minute drive to King Shaka International Airport. We are also 500m from the closest bus stop to go into Durban Central. at High tide. Carol & Henri are your friendly hosts. We are about 3 km from the local beach Ansteys, shark nets make it safe for bathing. A paddling pool for babies and another for toddlers, while the beach is not far for Dad. Life Guards are on duty all the year round. Ansteys has recently been awarded with the coveted international blue flag status. This is truly a great achievement. During July if you are lucky you can witness the sardine run and the dolphins swim by quite regularly. For those avid horse racing fans Greyville Race Course is not too far where you can have a good meal and enjoy a day or night of exciting racing. We are 30 minutes from King Shaka International Airport and 20 minutes from Durban Centre and The Suncoast Casino, & U Shaka Marine World. There is a minimum of 2 nights stay. Self catering cottage corner bath and separate shower. 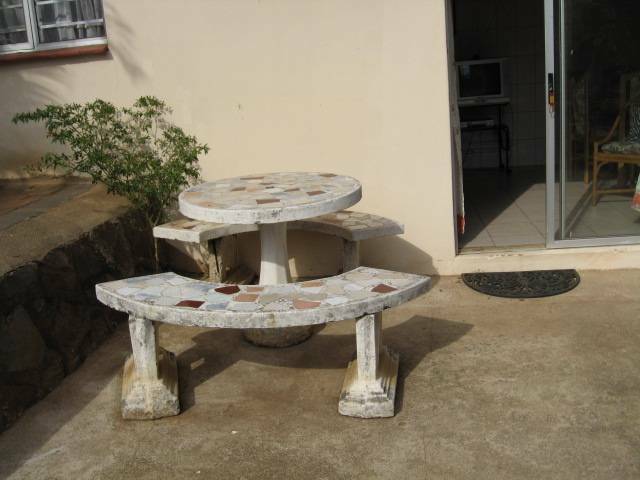 The dining room has an table that can seat 6. 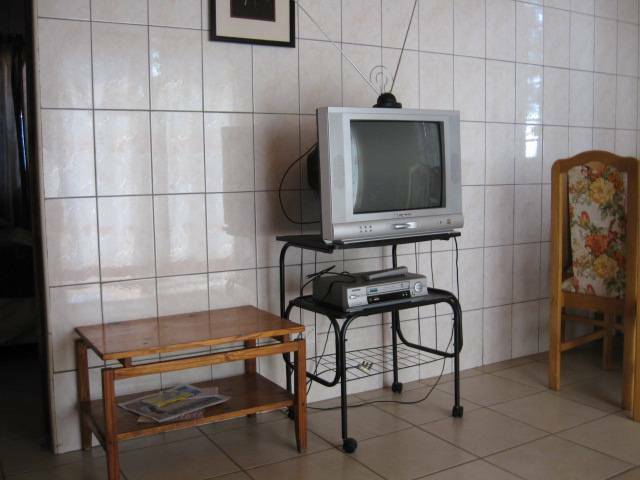 Television and VCR available all local channels. 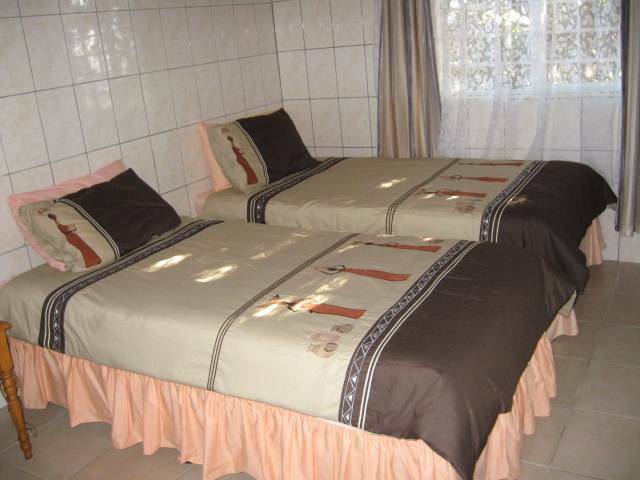 The main bedroom has a 3 single beds , we can convert 2 of the beds to a king size bed on request. Overhead fan and linen provided. The 2nd room has 3 single beds. Overhead fan and linen provided. We have a golf course nearby, virgin active gym, tennis courts, squash courts. The beach is 3 km away. There is also a tidal pool (a man made pool in the sea) , the waves come crashing over which is fun at High tide. Life guards are on duty for surfers and swimmers alike. [ Solomon Mhalangu drive] off Ramp, keep to the left and turn left at the robot.. You will pass the Albert Luthuli Hospital on your left, go over these robots and past the robots at the southway Mall. The next big intersection is South Coast Road. It is a big 3 lane road and the robot here is 4 phase. Cross over this robot and go under the M4 bridge above. Traveling on your will find Makro on your right and The Seafood Hall, further down you will cross another robot with to the Durban fresh produce market and the Mattress King on your right. Cross over this robot and will find that the road forks left and right. Bear off to the left into Bluff Road. Cross over the next robot at Bluff Pawnbrokers and the KFC then five roads on is Lobelia Road. We are no 27. Please use the lower driveway where you will see the cottage.